I mentioned a few weeks ago, that I’m really trying to eat “clean“. If you aren’t familiar with clean eating, let me explain… It’s about eating more of the best/healthiest options in each of the food groups, less of the not-so-healthy ones, and removing the preservatives and “fake” food that our body doesn’t know how to digest. I haven’t completely given up all the junk but I’m making small steps to remove processed foods and additives from my diet. 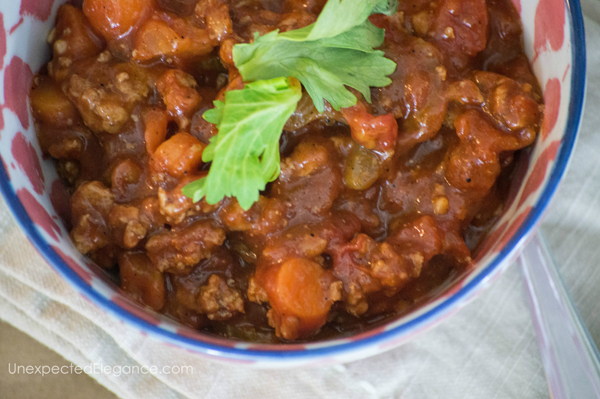 One of the easiest ways I am removing the additives is by making things in bulk, like pizza sauce, marinara and spice mixes (things that take little time to throw together). One of the hardest parts to eating clean is the food prep, so making things is batches is a huge time saver. 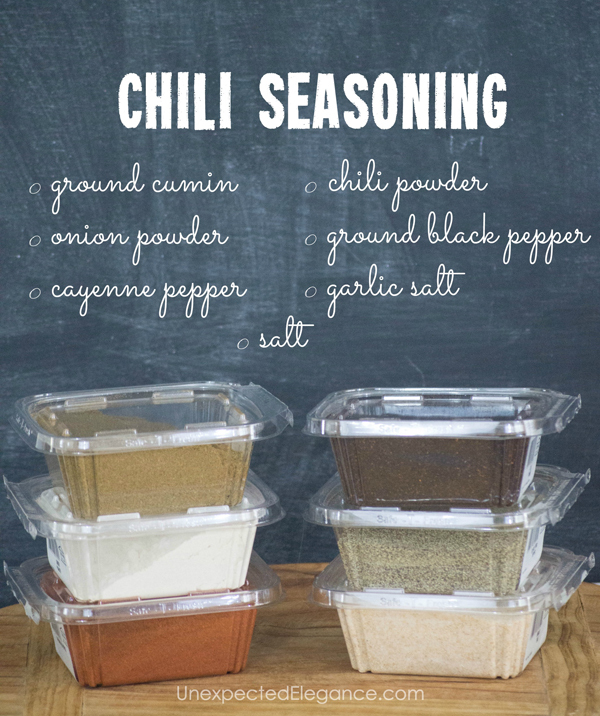 I purchased spices in bulk and then made taco seasoning and chili seasoning…two mixes we use on a regular basis. 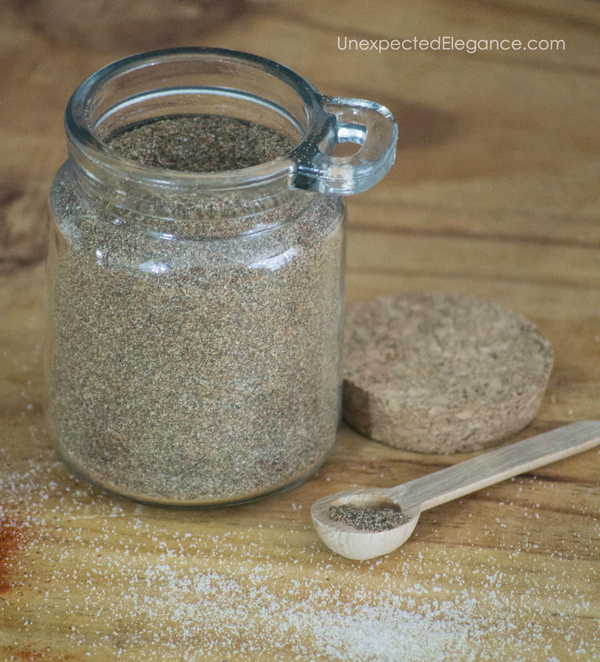 Measure out all the spices into a large bowl and then stir together until it’s completely blended. 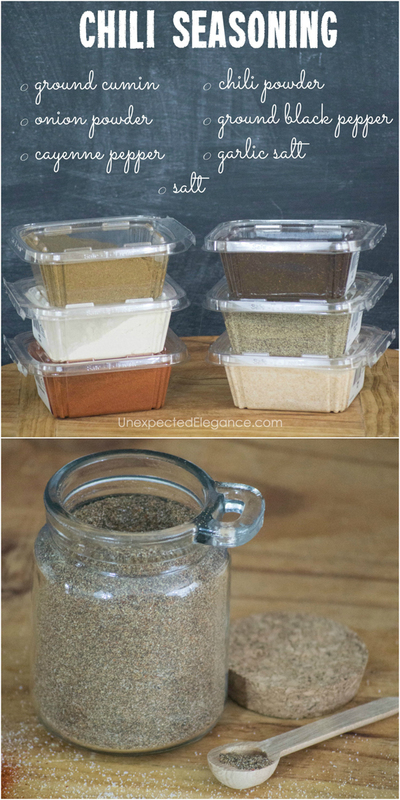 Store the mixture in an airtight container. 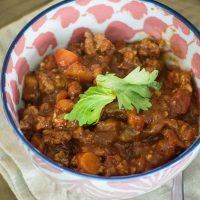 I used this seasoning blend to make different types of chili, but my new favorite is a no bean turkey chili. 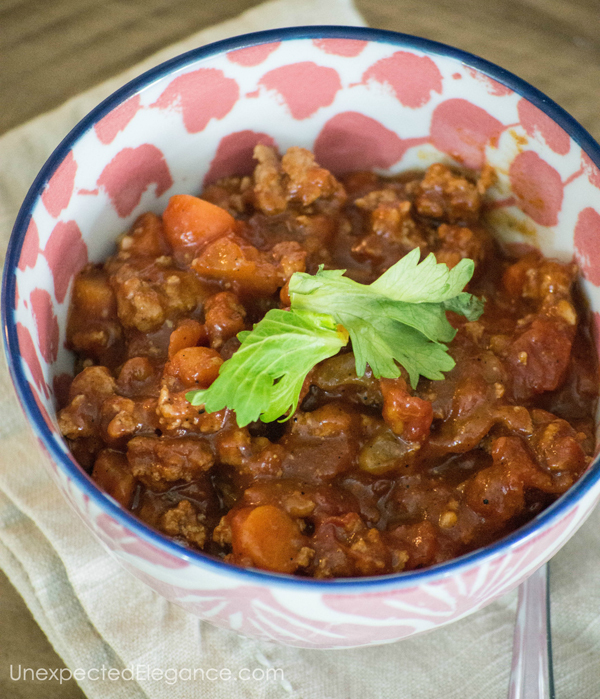 This chili is easy to make, delicious and healthy! Heat olive oil in Dutch oven over medium heat. Brown the turkey meat, drain the grease and then set to the side. Add diced carrot, garlic and diced celery. Saute until vegetables are soft, about 10 minutes. Add turkey, tomato past, spices, diced tomatoes, and chicken broth. Stir together well. Since I’m fairly new to clean eating, I would appreciate suggestions. If you have a meal your family loves, please share in the comments! Be sure to read the labels on your ground turkey package–it generally has a higher percentage of fat and unwelcome byproducts, like skin, in it than ground beef or pork. If you prefer the flavor of turkey, that’s great, but don’t assume ground turkey is a better, “cleaner” choice; it probably is not. And beans are about about as basic a quality nutrition source as you can find. Dry beans are so easy to prepare; you just have to decide you want them a little earlier in the process. Jenny, thanks so much for the suggestion!